Instant Confidence on Packed Snow and Ice! 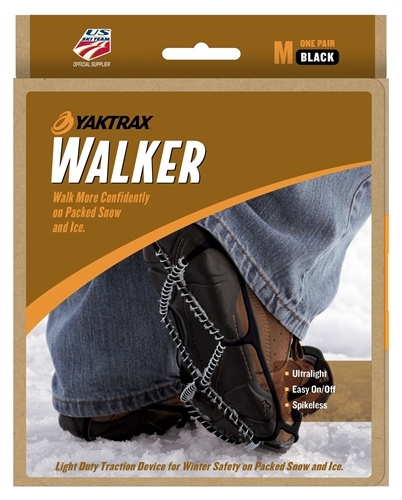 The original Yaktrax design, Yaktrax Walk is a lightweight and easy to use ice-traction device for your footwear. 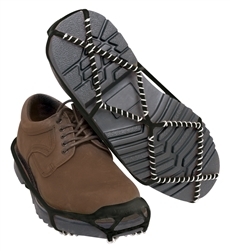 Perfect for pedestrians, professionals and the elderly, the Walk model provides greater stability while walking on snow or ice. The Yaktrax Walk reduces the risk of falls and injuries while walking to school, work, or just to the mailbox! No spikes, no straps, lightweight and easy to don and remove. 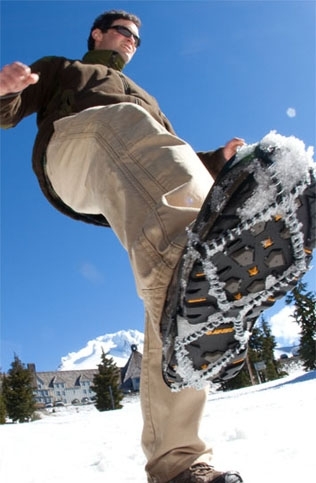 Reduce major injuries this winter on the ice and snow for your employees, loved ones, friends and yourself with a pair of Yaktrax. Worn by more than 1000 employees at the 2002 Salt Lake City Winter Olympics to help keep them on their feet. The Yaktrax secret? Tiny coils of steel create the Skidlock grip that imbeds hundreds of edges into the ice. When you walk in the Yaktrax Walker, every step you take places hundreds of biting edges in direct contact with the ice beneath your feet. Stability is provided in all directions. The Walker is made out of an injection molded thermal plastic elastomer designed for easy on and off. The coils are protected against rusting and hand-wound to give you 360 degrees of traction on ice and snow. LARGE: Men's 11.5 - 13.5; Women's 13 - 15.